I went to a soap making class a while back and the different soaps they demonstrated were glycerin based, pour and melt soaps. There are some really creative soap ideas out there! For my birthday- Soap Making Supplies! A Goat Milk's Soap base, a 4 bar plastic mold, some essential oils, colorant, and some soap additives(dried lavender and dried grated orange peel). 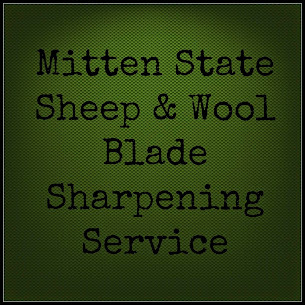 Everything I needed to make some soap. The directions are simple and easy. The soap base came in squares, each square being enough for one ounce. I used 12 squares/ounces for the first batch, which in the end did three bars. The next batch, I used 16 squares/ounces for 4 bars. 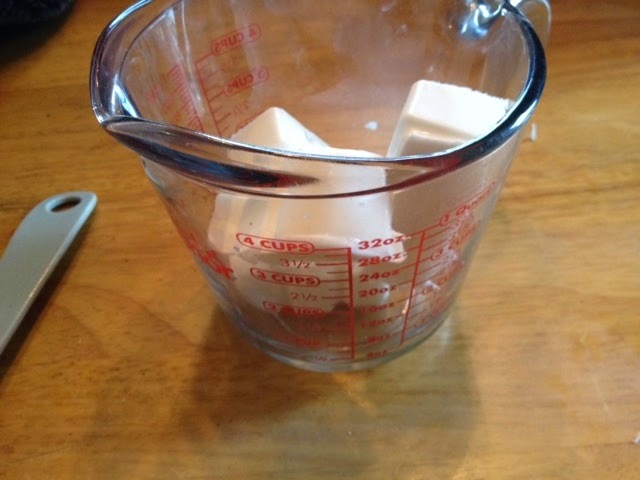 Place the cubes of soap in a microwave safe dish. I used a glass measuring cup. 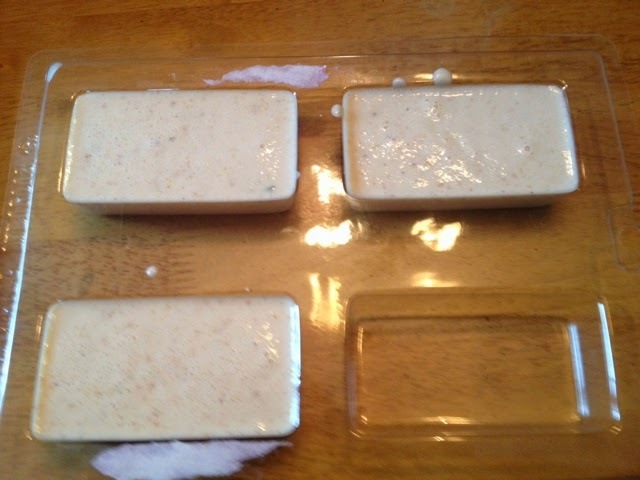 Microwave the soap for 30 seconds, stir and then microwave in intervals of 5-10 seconds. Checking and stirring the soap in between. My microwave is old and that 10 seconds wasn't cutting it. So, I worked in 30 second intervals and when the soap was getting close to being melted I knocked it down to 15 seconds. When the soap is completely melted you add the essential oils, colorants, and other additives. For the oils, the recommendation was 1 drop per ounce of soap. 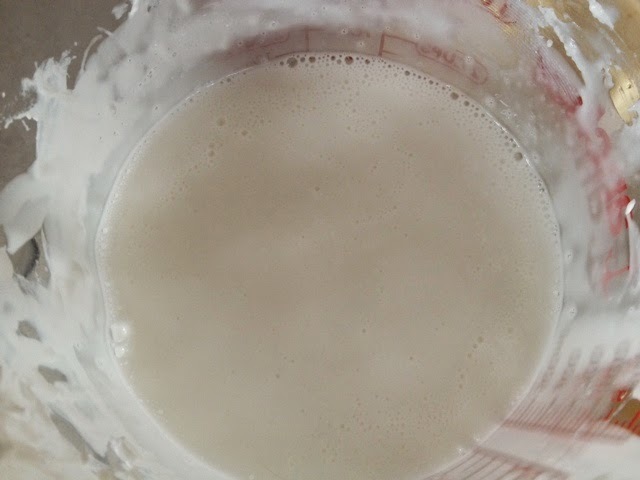 For the colorant, the directions didn't give an amount to add-so I just added enough to get the results I wanted. The first batch I did was orange. I added the Orange Essential oil, some orange colorant, and some grated, dried orange peel. Stirred Well. Poured into the individual molds. For the second batch I did Lavender. 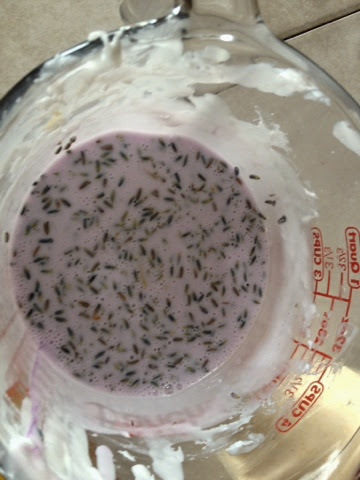 I added Lavender essential oil, some purple colorant and some dried Lavender. Stirred Well. Poured into individual molds. The dried Lavender didn't mix in very well, it all floated to the top of the bar. I read later that if you let it cool a bit before you put in your additives (dried herbs, etc) you have better luck with it staying mixed in throughout the bar. I think it will take some practice to get the right amount of oils. The lavender was strong, but the orange was not strong enough. 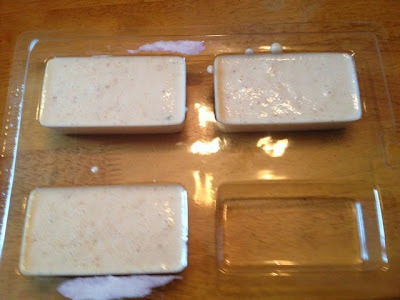 I like making the CP (cold processed) soap and plan on making more of that when I am milking goats. But the melt and pour soaps were a fun, quick project. They have quite a variety of bases you can use. I found some really cute sheep molds I am going to buy. I am not sure if I can use them with the CP soaps (will have to check the temperatures) but I can use them with the melt and pour based soaps. What could be cuter than little lamb soaps? I do a lot of melt and pour. It is fun! Nice post and two of my very favorite scents...o you grow your own lavendar? Fiona. This was purchased. I have tried growing Lavender, without much luck. I may try growing it in pots this year. 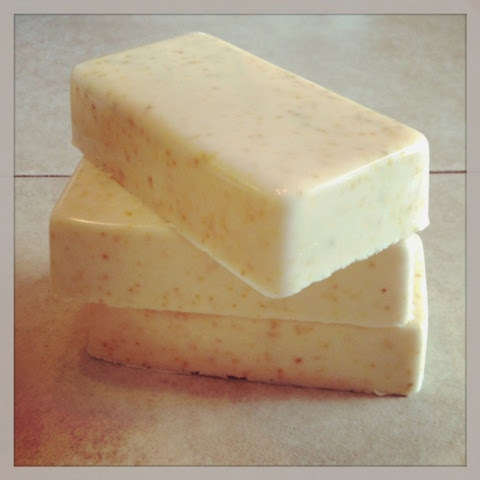 I am taking a soap making class in a few weeks, so excited! You are right there are so many neat recipes out there!!! I hope you post more! Soap making is always so fun! Your bars look lovely! Thanks for sharing. If we sell our goats soon, I won't have goat's milk to make our soap any longer. I do love our goat's milk soap though. I started my soap making journey with melt and pour and it is alot of fun! I like your choices. This is such a helpful tutorial! I love the color of the lavender soap. Can't wait to make my own one day! 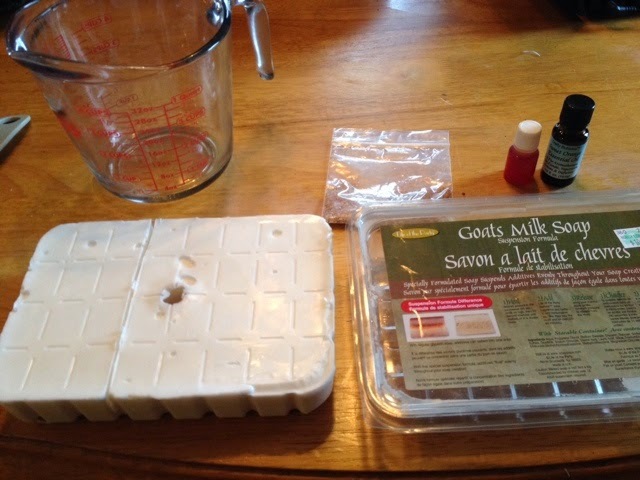 Great tutorial on making goat milk soap. I had a cousin that raised goats and at Christmas we would wait in anticipation of her homemade soap. Just wonderful. Thank you for sharing with the Clever Chicks Blog Hop! I hope you’ll join us again next week! That is such a great idea and I bet not only does it smell wonderful it is easy on the skin. Thank you for sharing on our Four Seasons Blog Hop. Pinning Now. How fun I haven't made soap in years. These sound great!